Kaliningrad Oblast (Russian: Калинингра́дская о́бласть, Kaliningradskaya oblast), often referred to as the Kaliningrad Region in English, or simply Kaliningrad, is a federal subject of the Russian Federation that is located on the coast of the Baltic Sea. As an oblast, its constitutional status is equal to each of the other 84 federal subjects. Its administrative center is the city of Kaliningrad, formerly known as Königsberg. It is the only Baltic port in the Russian Federation that remains ice-free in winter. According to the 2010 census, it had a population of 941,873. 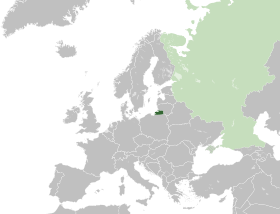 The oblast is an exclave, bordered by Poland to the south and Lithuania to the east and north, so residents may only travel visa-free to the rest of Russia via sea or air. The territory was formerly the northern part of East Prussia, with the southern part now being Poland's Warmian-Masurian Voivodeship. With the defeat of Nazi Germany in 1945, the territory was annexed by the Soviet Union. Following the post-war migration and Flight and expulsion of Germans (1944–50), the territory was populated with citizens from the Soviet Union. Today virtually no ethnic Germans remain; most of the several thousand who live there are recent immigrants from other parts of the former Soviet Union. Early in the 21st century, the hitherto fledgling economy of Kaliningrad Oblast became one of the best performing economies in Russia. This was helped by a low manufacturing tax rate related to its "Special Economic Zone" (SEZ) status. As of 2006[update], one in three televisions manufactured in Russia came from Kaliningrad. The territory's population was one of the few in Russia that was expected to show strong growth after the collapse of the USSR. During the Middle Ages, the territory of what is now Kaliningrad Oblast was inhabited by tribes of Old Prussians (Sambians) in the western part and by Lithuanians in the eastern part. The tribes were divided by the rivers Pregolya and Alna. The Teutonic Knights conquered the region and established a monastic state. On the foundations of a destroyed Prussian settlement known as Tvanksta, the Order founded the city of Königsberg (modern Kaliningrad). Germans resettled the territory and assimilated the indigenous Old Prussians. The Lithuanian-inhabited areas became known as Lithuania Minor. Speakers of the old Baltic languages became extinct around the 17th century, having been assimilated and Germanised. In 1525, Grand Master Albert of Brandenburg secularized the Prussian branch of the Teutonic Order and established himself as the sovereign of the Duchy of Prussia. The duchy was nominally a fief of the Polish crown. It later merged with the Margraviate of Brandenburg. Königsberg was the duchy's capital from 1525 until 1701. As the centre of Prussia moved westward, the position of the capital became too peripheral and Berlin became the new Prussian capital city. During the Seven Years' War it was occupied by the Russian Empire. The region was reorganized into the Province of East Prussia within the Kingdom of Prussia in 1773. The territory of the Kaliningrad Oblast lies in the northern part of East Prussia. The annexation of the territory, while supposedly on a temporary basis, was approved by the "Big Three" allied leaders of World War II in the Potsdam Agreement in 1945. Three years after the annexation by the Russian Soviet Federative Socialist Republic, the remaining two-thirds of East Prussia was annexed by Poland and is today organised into the Warmian-Masurian province. In 1824, shortly before its merger with West Prussia, the population of East Prussia was 1,080,000 people. Of that number, according to Karl Andree, Germans were slightly more than half, while 280,000 (~26%) were ethnically Polish and 200,000 (~19%) were ethnically Lithuanian. As of 1819 there were also 20,000 strong ethnic Curonian and Latvian minorities as well as 2,400 Jews, according to Georg Hassel. Similar numbers are given by August von Haxthausen in his 1839 book, with a breakdown by county. However, the majority of East Prussian Polish and Lithuanian inhabitants were Lutherans, not Roman Catholics like their ethnic kinsmen across the border in the Russian Empire. Only in Southern Warmia (German: Ermland) Catholic Poles - so called Warmiaks (not to be confused with predominantly Protestant Masurians) - comprised the majority of population, numbering 26,067 people (~81%) in county Allenstein (Polish: Olsztyn) in 1837. Another minority in 19th century East Prussia, were ethnically Russian Old Believers, also known as Philipponnen - their main town was Eckersdorf (Wojnowo). In year 1817, East Prussia had 796,204 Evangelical Christians, 120,123 Roman Catholics, 864 Mennonites and 2,389 Jews. East Prussia was an important centre of German culture. Many important figures, such as Immanuel Kant and E. T. A. Hoffmann, came from this region. Despite being heavily damaged during World War II and thereafter, the cities of the oblast still contain examples of German architecture. The Jugendstil style showcases the rich German history and cultural importance of the area. By the early 20th century, Lithuanians formed a majority only in rural parts of the north-eastern corner of East Prussia (Memelland and Lithuania Minor). A similar fate befell the Latvian-speaking Kursenieki who had settled the coast of East Prussia between Gdańsk and Klaipėda. The rest of the area, with the exception of the Slavic Masurians in southern Prussia, was overwhelmingly German-speaking. The Memel Territory (Klaipėda region), formerly part of north-eastern East Prussia as well as Lithuania Minor, was annexed by Lithuania in 1923. In 1938, Nazi Germany radically altered about a third of the place names of this area, replacing Old Prussian and Lithuanian names with newly invented German names. Slavic and Jewish populations under Nazi Germany were classified as subhuman and were the target of a campaign of genocide by the German state, with the eventual goal of their extermination. 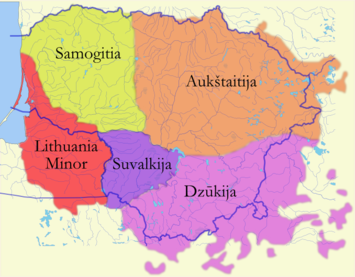 Historical Lithuania Minor comprises a sizeable part of Prussian region that is now the Kaliningrad Oblast. The Latvian-speaking Kursenieki spit in 1649. 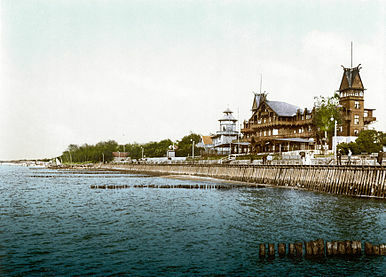 The East Prussian resort town of Cranz (Zelenogradsk today) as it looked ca. 1900. It was a destination for German artists and intelligentsia. The Conference examined a proposal by the Soviet Government that pending the final determination of territorial questions at the peace settlement, the section of the western frontier of the Union of Soviet Socialist Republics which is adjacent to the Baltic Sea should pass from a point on the eastern shore of the Bay of Danzig to the east, north of Braunsberg - Goldep, to the meeting point of the frontiers of Lithuania, the Polish Republic and East Prussia. Königsberg was renamed Kaliningrad in 1946 in memory of Chairman of the Presidium of the Supreme Soviet of the USSR Mikhail Kalinin. The remaining German population was forcibly expelled between 1947 and 1948. The conquered territory was populated with citizens of the Soviet Union, mostly ethnic Russians but to a lesser extent by Ukrainians and Belarusians. The German language was replaced with the Russian language. In 1950, there were 1,165,000 inhabitants, which was only half the number of the pre-war population. The city was rebuilt during the Cold War. The territory became strategically important as the headquarters of the Soviet Baltic Fleet. Consequently, the city was closed to foreign visitors. In 1957, an agreement was signed and later came into force which delimited the border between Poland and the Soviet Union. The region was added as an exclave to the Russian SFSR; since 1946 it has been known as the Kaliningrad Oblast. According to some historians, Stalin created it as an oblast separate from the Lithuanian SSR because it further separated the Baltic states from the West. The names of the cities, towns, rivers and other geographical features were changed to Russian names. The area was administered by the planning committee of the Lithuanian SSR, although it had its own Communist Party committee. However, the leadership of the Lithuanian SSR (especially Antanas Sniečkus) refused to annex the territory. In 2010, the German magazine Der Spiegel published a report claiming that Kaliningrad had been offered to Germany in 1990 (against payment), but this was denied by Mikhail Gorbachev. The Cathedral of Christ the Saviour in Kaliningrad is the largest church of Kaliningrad Oblast. The Russian Orthodox cathedral is 70 metres (230 ft) high, and it is the dominant building of the inner city on Ploshchad Pobedy. Kaliningrad's isolation was exacerbated by the collapse of the Soviet Union in 1991 when Lithuania became an independent country and even more when both Poland and Lithuania became members of NATO and subsequently the European Union in 2004. Since the dissolution of the Soviet Union and the independence of the Baltic states, Kaliningrad Oblast has been separated from the rest of Russia by other countries instead of by other Soviet republics. Neighboring nations imposed strict border controls when they joined the European Union. All military and civilian land links between the region and the rest of Russia have to pass through members of NATO and the EU. Russian proposals for visa-free travel between the EU and Kaliningrad have so far been rejected by the EU. Travel arrangements, based on the Facilitated Transit Document (FTD) and Facilitated Rail Transit Document (FRTD) have been made. The territory's economic situation was badly affected by its geographic isolation and the significant reduction in the size of the Russian military garrison, which had previously been one of the major employers and helped the local economy. After 1991, some ethnic Germans began to return to the area, such as Volga Germans from other parts of Russia and Kazakhstan, especially after Germany raised the requirements for people from the former Soviet Union to be accepted as ethnic Germans and have a "right of return". These Germans are overwhelmingly Russian-speaking and as such were rejected for resettlement within Germany under Germany's new rules. A similar migration by Poles from the lands of the former Soviet Union to the Kaliningrad Oblast occurred at this time as well. The situation has begun to change, albeit slowly. 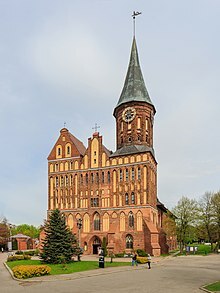 Germany, Lithuania, and Poland have renewed contact with Kaliningrad Oblast, through town twinning and other projects. This has helped to promote interest in the history and culture of the East Prussian and Lietuvininkai communities. In July 2005, the 750-year jubilee of the city was widely celebrated. In July 2007, Russian First Deputy Prime Minister Sergei Ivanov declared that if US-controlled missile defense systems were deployed in Poland, then nuclear weapons might be deployed in Kaliningrad. On November 5, 2008, Russian leader Dmitry Medvedev said that installing missiles in Kaliningrad was almost a certainty. These plans were suspended in January 2009, but implemented in October 2016. In 2011, a long range Voronezh radar was commissioned to monitor missile launches within about 6,000 km. 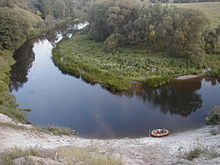 It is situated in the settlement of Pionersky (formerly German Neukuhren) in Kaliningrad Oblast. Kaliningrad is the only Russian Baltic Sea port that is ice-free all year round and hence plays an important role in maintenance of the Baltic Fleet. As an exclave of Russia proper, it is surrounded by Poland (Pomeranian Voivodeship and Warmian-Masurian Voivodeship), Lithuania (Klaipėda County, Marijampolė County and Tauragė County) and the Baltic Sea. Its largest river is the Pregolya. It starts as a confluence of the Instruch and the Angrapa and drains into the Baltic Sea through the Vistula Lagoon. Its length under the name of Pregolya is 123 km (76 mi), 292 km (181 mi), including the Angrapa. The current governor (since 2017) of Kaliningrad Oblast is Anton Alikhanov. The latest elections to the region's legislative body, the 40-seat Kaliningrad Oblast Duma, were held in September 2016. According to the 2010 Census, the oblast population was 941,873; down from 955,281 recorded in the 2002 Census. The 1989 Census recorded 871,283 inhabitants. Kaliningrad Oblast was the fourth most densely populated federal subject in Russia, with 62.5 persons/km2 (162 persons/sq mi). Population-wise, the oblast is thoroughly Russian and Russophone in character, with almost none of the pre–World War II German, Lithuanian (Lietuvininks), Latvian-speaking Kursenieki, or Polish population remaining in today's Kaliningrad Oblast. However, after 1991, some ethnic Germans and Poles began to return to the area, from Kazakhstan, Russia, and other sites in the former Soviet Union. 48,021 people were registered from administrative databases and could not declare an ethnicity. It is estimated that the proportion of ethnicities in this group is the same as that of the declared group. 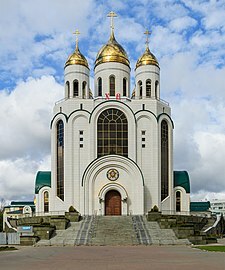 According to a 2012 survey 34 per cent of the population of Kaliningrad Oblast declare themselves to be "spiritual but not religious", 30.9 per cent adhere to the Russian Orthodox Church, 22 per cent are atheist and 11.1 per cent follow other religions or did not give an answer to the question, 1 per cent are unaffiliated generic Christians and 1 per cent adhere to the Catholic Church. Until 1945, the region was overwhelmingly Lutheran, with a small number of Catholics and Jews. The state church of Prussia was dominant in the region. Although it was both Reformed and Lutheran since 1817, there was an overwhelming Lutheran majority and very few Reformed adherents in East Prussia. For some years after the fall of the Soviet Union, Kaliningrad Oblast was one of the most militarized areas of the Russian Federation and the density of military installations was the highest in Europe, as much of the Soviet equipment pulled out of Eastern Europe was left there. As of 2009, there were 11,600 Russian ground troops based in the oblast, plus additional naval and air force personnel. Thus military troops amount to less than 2% of the oblast's population. Kaliningrad is the headquarters of the Russian Baltic Fleet together with Chernyakhovsk (air base), Donskoye (air base) and Kaliningrad Chkalovsk (naval air base). The Washington Times wrote on January 3, 2001, citing anonymous intelligence reports, that Russia had transferred tactical nuclear weapons into a military base in Kaliningrad for the first time since the end of the Cold War. Russian top-level military leaders denied those claims. A Pentagon spokesperson said that such deployment would violate the Russian pledge to remove nuclear weapons from the Baltics. Russia and the United States announced in 1991 and 1992 a non-binding agreement to reduce arsenals of tactical nuclear weapons. On November 5, 2008, Russian President Dimitry Medvedev said that Russia would deploy Iskander missiles in the oblast "as a response to U.S. plans for basing missile defense missiles in Poland," adding that the country also deployed equipment to electronically hamper the operation of future U.S. missile facilities in Poland and the Czech Republic. However, on January 28, 2009, a Russian defense official stated that the deployment of short-range missiles in Kaliningrad Oblast would cease, due to "perceived changes in the attitude of the United States government towards the Russian Federation," following the election of United States President Barack Obama. In September 2009, Russia fully scrapped plans to send short-range missiles into the Kaliningrad Oblast in response to Obama's decision to cancel the missile defense system. In November 2011, Dmitry Medvedev issued another stern warning that Russia would deploy new missiles aimed at U.S. missile defense sites in Europe if the U.S. went ahead with the planned shield. Then in 2012, Russia chose Kaliningrad as the second region (after Moscow) to deploy the S-400 (SAM) missile system. Subsequently, Russian newspaper Izvestia reported in Dec 2013 that the short range Iskander-M 9K720 operational-tactical missile systems had been commissioned by the Western Military District's missile and artillery forces at about the same time. According to statistics in 2016 Kaliningrad had Nominal GDP of US$7 billion and US$7,000 per capita. Kaliningrad Oblast's economy is positively influenced by several factors, such as ice-free ports, the world's largest amber deposits and proximity to European countries. The region also has a developed tourist infrastructure, unique museums and monuments, and tourist attractions. One of these is the Curonian Spit. To combat the oblast's economic problems such as high unemployment, in 1996 the Russian authorities granted Kaliningrad special economic status and tax advantages intended to attract investors. The oblast's economy has since benefited substantially and in recent years[when?] experienced a boom. A US$45 million airport terminal has been opened and the European Commission provides funds for business projects under its special program for the region. The oblast has begun to see increasing trade with the countries of the EU as well as increasing economic growth and rising industrial output. According to official statistics, the Gross Regional Product in 2006 was 115 billion roubles. GRP per capita in 2007 was 155.669 billion roubles. Car and truck assembly (GM, BMW, Kia, Yuejin), and production of auto parts, are major industries in Kaliningrad Oblast. There are shipbuilding facilities in Kaliningrad and Sovetsk. Food processing is a mature industry in the region. OKB Fakel, a world leader in the field of Hall thruster development, as well as a leading Russian developer and manufacturer of electric propulsion systems, is based in Neman. The company employs 960 people. General Satellite (GS) is the biggest employer in Gusev city producing satellite receivers, cardboard packaging, nanomaterials etc. Kaliningrad Oblast possesses more than 90 per cent of the world's amber deposits. Until recently raw amber was exported for processing to other countries, but in 2013 the Russian government banned the export of raw amber in order to boost the amber processing industry in Russia. There are small oil reservoirs beneath the Baltic Sea not far from Kaliningrad's shore. Small-scale offshore exploration started in 2004. Poland, Lithuania, and some local NGOs, voiced concerns about possible environmental effects. Fishing is an important regional industry, with big fishing ports in Kaliningrad and Pionersky (formerly Neukuhren) and smaller ones in Svetly and Rybachy. Average yearly power consumption in the Kaliningrad Oblast was 3.5 terawatt-hours in 2004 with local power generation providing just 0.235 terawatt-hours. The balance of energy needs was imported from neighboring countries. A new Kaliningrad power station was built in 2005, covering 50% of the oblast's energy needs. A second part of this station was built in 2010, making the oblast independent from electricity imports. As of 2018[update], two nuclear power reactors are currently under construction in the eastern part of the region. ^ "Kaliningrad profile". BBC News. March 12, 2015. ^ Sheeter, Laura (October 16, 2006). "Kaliningrad erases stains of past". BBC News. Retrieved May 7, 2010. ^ Plater, Stanisław (1825). Jeografia wschodniéy części Europy czyli Opis krajów przez wielorakie narody słowiańskie zamieszkanych: obejmujący Prussy, Xsięztwo Poznańskie, Szląsk Pruski, Gallicyą, Rzeczpospolitę Krakowską, Krolestwo Polskie i Litwę (in Polish). Wrocław: u Wilhelma Bogumiła Korna. p. 17. ^ Andree, Karl (1831). Polen: in geographischer, geschichtlicher und culturhistorischer Hinsicht (in German). Verlag von Ludwig Schumann. p. 218. ^ Hassel, Georg (1823). Statistischer Umriß der sämmtlichen europäischen und der vornehmsten außereuropäischen Staaten, in Hinsicht ihrer Entwickelung, Größe, Volksmenge, Finanz- und Militärverfassung, tabellarisch dargestellt; Erster Heft: Welcher die beiden großen Mächte Österreich und Preußen und den Deutschen Staatenbund darstellt (in German). Verlag des Geographischen Instituts Weimar. p. 41. ^ a b Haxthausen, August (1839). Die Ländliche Verfassung in den Einzelnen Provinzen der Preussischen Monarchie (in German). pp. 75–91. ^ "Monastery of the Dormition of the Mother of God in Wojnowo (Eckersdorf)". wojnowo.net. ^ Tetzner, Franz (1902). Die Slawen in Deutschland: beiträge zur volkskunde der Preussen, Litauer und Letten, der Masuren und Philipponen, der Tschechen, Mährer und Sorben, Polaben und Slowinzen, Kaschuben und Polen. Braunschweig: Verlag von F. Vieweg. pp. 212–248. ^ "Old Believers in Poland - historical and cultural information". Poland's Linguistic Heritage. ^ Hoffmann, Johann Gottfried (1818). Übersicht der Bodenfläche und Bevölkerung des Preußischen Staates : aus den für das Jahr 1817 mtlich eingezogenen Nachrichten. Berlin: Decker. p. 51. ^ "THE POTSDAM DECLARATION". Retrieved April 2, 2009. ^ a b Milan Bufon (April 11, 2014). The New European Frontiers: Social and Spatial (Re)Integration Issues in Multicultural and Border Regions. Cambridge Scholars Publishing. p. 98. ISBN 9781443859363. ^ "Russia (USSR) / Poland Treaty (with annexed maps) concerning the Demarcation of the Existing Soviet-Polish State Frontier in the Sector Adjoining the Baltic Sea 5 March 1957" (PDF). Retrieved April 2, 2009. ^ For other issues of the frontier delimitation see "Maritime boundary delimitation agreements and other material". Retrieved April 2, 2009. ^ Weinberg, Gerhard L. (2005). Visions of Victory: The hopes of eight World War II leaders. Cambridge University Press. p. 114. ISBN 978-0-521-85254-8. ^ Cahoon, Ben. "Russian Soviet Federative Socialist Republic (SFSR) Administrative Divisions". www.worldstatesmen.org. Retrieved January 28, 2019. ^ a b "The requested document does not exist. - EUR-Lex". eur-lex.europa.eu. ^ Harding, Luke (January 28, 2009). "Russia scraps plan to deploy nuclear-capable missiles in Kaliningrad". The Guardian – via www.theguardian.com. ^ "Russia moves missiles to Kaliningrad". BBC News. October 9, 2016 – via www.bbc.com. ^ Sudakov, Dmitry (November 28, 2011). "Russia's new radar to monitor all Europe including Britain". ^ "Age-specific fertility rates (Ru:Возрастные коэффициенты рождаемости)" (PDF). ^ "Archive Search Results". nl.newsbank.com. ^ "Russia to move missiles to Baltic". bbc.co.uk. BBC. November 5, 2008. Retrieved November 12, 2008. ^ "Russia 'halts missile deployment'". bbc.co.uk. BBC. January 28, 2009. Retrieved January 28, 2009. ^ "Dmitry Medvedev, Russia President, Says Missiles May Target U.S. Missile Defense Sites". Huffington Post. November 23, 2011. ^ "S-400 Missiles Deployed in Russia's Baltic Fleet." RIA Novosti, April 9, 2012. ^ "Kaliningrad Region - Introduction". Russia: All Regions Trade & Investment Guide. CTEC Publishing LLC. 2008. ^ "Regions and territories: Kaliningrad". BBC News. May 15, 2009. Retrieved June 5, 2009. ^ "EDB Fakel". OKB Fakel. Archived from the original on October 12, 2009. Retrieved June 4, 2009. ^ "OKB Fakel (Russian Federation)". Jane's Space Systems and Industry. December 17, 2008. Retrieved June 4, 2009. ^ Sputnik. "Here's What Baltic Countries Really Fear From Russia (and It's Not Invasion)". sputniknews.com. Retrieved June 27, 2018. Областная Дума Калининградской области. Закон №30 от 18 января 1996 г. «О вступлении в действие Устава (Основного Закона) Калининградской области», в ред. Закона №483 от 2 декабря 2015 г «О внесении изменения в Устав (Основной Закон) Калининградской области». Вступил в силу по истечении десяти дней со дня официального публикования, за исключением пункта 5 статьи 15 и подпункта "б" статьи 22 в части подписания постановлений областной Думы председателем областной Думы, которые введены в действие одновременно со вступлением в силу Федерального закона от 06.10.1999 №184-ФЗ "Об общих принципах организации законодательных (представительных) и исполнительных органов государственной власти субъектов Российской Федерации". Опубликован: "Янтарный край", №20, 26 января 1996 г. (Oblast Duma of Kaliningrad Oblast. Law #30 of January 18, 1996 On the Charter (Basic Law) of Kaliningrad Oblast Taking Effect, as amended by the Law #483 of December 2, 2015 On Amending the Charter (Basic Law) of Kaliningrad Oblast. Effective as of the date ten days after the official publication date, with the exception of item 5 of Article 15 and the portion of subitem "b" of Article 22 dealing with the signing of the resolutions of the Oblast Duma by the Chair of the Oblast Duma, which take effect simultaneously with the Federal Law #184-FZ of October 6, 1999 "On the General Principles of the Organization of the Legislative (Representative) and Executive Organs of the State Power in the Federal Subjects of the Russian Federation".). Wikimedia Commons has media related to Kaliningrad Oblast. Wikivoyage has a travel guide for Kaliningrad Oblast.